The presumed death toll from the London tower block inferno jumped to 58 on Saturday as embattled Prime Minister Theresa May, accused of misreading the growing anger over the tragedy, pledged action after meeting survivors desperately seeking answers. Dozens of people were still missing three days after the 24-storey Grenfell Tower was engulfed in flames, and worries over the safety of the apartment block's charred wreck has slowed the search for human remains. Sixteen bodies have been taken to a mortuary, and the first victim formally identified was named as Mohammad Alhajali, a 23-year-old Syrian refugee. But public anger has been swelling, with furious residents heckling May and storming the local authority headquarters on Friday. 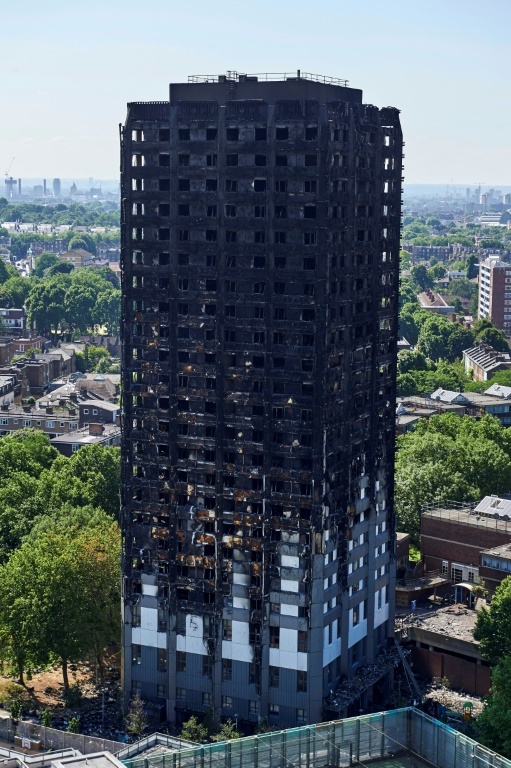 They demanded justice for the victims and claimed Wednesday's fatal blaze was due to negligence, with many citing the new cladding put on the 1974 concrete tower. "It was a death trap, and they knew it," one person shouted as demonstrators surged inside the offices of the Kensington and Chelsea council, responsible for managing the social housing block in a working-class enclave of one of Britain's richest districts. "There are 58 people who we have been told were in Grenfell Tower on the night that are missing and therefore, sadly, I have to assume that they are dead," police commander Stuart Cundy told reporters at the scene. He said that number could change should further information come to light. The area surrounding the tower has been plastered by distraught relatives with pictures of the missing, from grandparents to young children. Morocco said seven of its nationals were among the dead. May was criticised for avoiding locals when she visited the disaster site on Thursday and faced cries of "Shame on you" and "coward" when she returned the following day, with police breaking up scuffles. On Saturday May met a group of 15 victims, residents, volunteers and community leaders at her Downing Street office. Demonstrators gathered outside, protesting about several issues including the fire. "Everything possible will be done to help them," the prime minister said of the victims in a statement. She said support on the ground for families immediately after the blaze was "not good enough" and ordered that more staff be deployed at the scene in high-visibility clothing. May said those living in similar high-rises "also want answers" and ordered local authorities to complete urgent safety checks. "The fire at Grenfell Tower was an unimaginable tragedy for the community, and for our country. My government will do whatever it takes to help those affected, get justice and keep our people safe," she said. May who has promised £5 million ($6.4 million, 5.7 million euros) for emergency supplies, food and clothing, has also announced a judge-led inquiry into the disaster. There are questions about why the block was not fitted with sprinklers or a central smoke alarm, as well as whether the recent refurbishment -- including the use of cladding that was blamed for worsening previous building fires in France, the United Arab Emirates and Australia -- helped fuel the flames. May said she would be responsible for implementing the inquiry's findings, while the victims' legal costs would be met by the government. Everyone displaced will be housed nearby within three weeks, she promised. Some 19 patients are still being treated in hospital, of whom 10 are in a critical condition, the National Health Service said. Queen Elizabeth and her grandson Prince William visited a community centre Friday where some survivors are being housed, with volunteers inundated with donations of clothes and food. The monarch stood for a minute's silence before her 91st birthday parade on Saturday. "It is difficult to escape a very sombre national mood," she said in a message marking the event. The fire forced residents to flee through black smoke down the single stairwell, jump out of windows or even drop their children from the 120-apartment building. Alhajali, who lived on the 14th floor, was a civil engineering student at West London University. He came to Britain in 2014 with his brother. "Mohammad was a very amazing and kind person. He gave love to everyone," his family said in a statement. "He came to the UK because he had ambitions and aims for his life and for his family. Our whole family will miss Mohammad dearly and he will never be forgotten."